In 2006, the city of San Diego began allowing political campaigns to electronically file their financial reports, giving the public easy access to information on money in city politics. The county of San Diego wasn’t as quick to make the same kind of information available and continues to lag behind the city’s efforts. The county didn’t require campaigns to e-file until 2015 — nine years after the city. An inewsource analysis shows 41 percent of the county’s campaign finance reports have been e-filed from January through March, compared to 67 percent of the city’s reports. “Considering that just a couple years ago that zero individuals were e-campaign filing, 40 percent is absolutely a great mark thus far,” said county Registrar of Voters Michael Vu. The city’s system isn’t perfect, but it’s easier to search than the county’s. 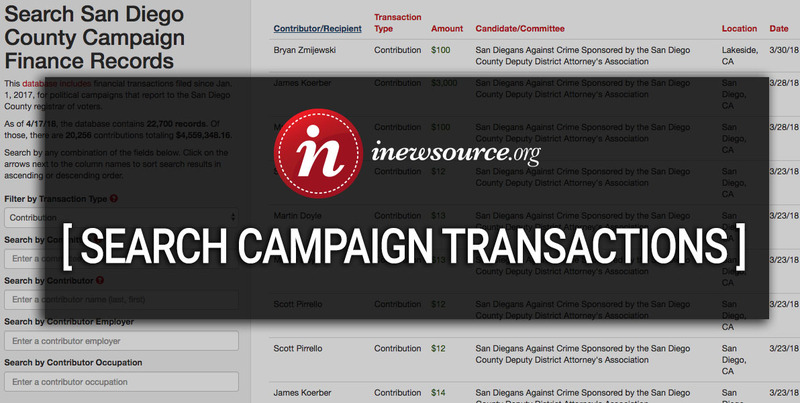 So inewsource has compiled the county’s e-filed reports into an easy-to-use searchable database that includes money raised and spent by campaigns since January 2017. inewsource will update it throughout the 2018 election season. Experts say e-filed records are key for transparency in elections. They make it easy to see where candidates are getting money from and what they’re spending money on, and they show the money being raised and spent to support ballot measures. “If you can’t figure out where the money for a particular candidate is coming from, you are lacking critical knowledge about where that candidates’ priorities may lie,” said David Snyder, executive director of the California-based First Amendment Coalition. “There’s a whole ocean of information that’s contained in electronic documents that really isn’t there with the paper documents,” Snyder said. Both the city and county have a law requiring campaigns that spend or raise at least $10,000 to e-file their financial reports. Most San Diego campaigns have to e-file because most of them are supporting City Council candidates, who tend to raise more than $10,000. But the county is responsible for collecting financial reports for more than 700 elected positions, and many don’t hit the $10,000 limit, including some candidates running in special districts that handle water, firefighting, health care, irrigation and other services. Others do hit the $10,000 mark, including most people running for Board of Supervisors, district attorney and sheriff. The county also collects campaign reports for community college and school districts. Reports that haven’t been e-filed are posted on the city’s and county’s websites as PDFs that can’t be searched and analyzed, which is why you won’t find them in inewsource’s new county campaign finance database. San Diego City Clerk Liz Maland said having so many of the city’s candidates e-file saves the government time and money. The city spends $75,000 a year on its e-filing system, but Maland estimates doing the same work by hand would cost at least twice as much. E-filing systems do much of that manual labor automatically. They can immediately redact sensitive information such as donor addresses, verify that all parts of the forms were filled out and check for any math that doesn’t add up. Plus, the documents are already digitized, as opposed to paper records that need to be scanned and posted online. The county also saves money when candidates e-file, said Vu, including by not having to store and file paper records. His office pays about $82,000 a year for its e-filing system. Vu said e-filed records also help educate voters by making data more accessible, and his office encourages campaigns to e-file even when they don’t have to. “The public needs to understand where the money is flowing, and that is potentially decisive in how they may vote come election day,” he said. So given its benefits, why doesn’t the county make more campaigns file electronically by lowering the dollar threshold to force e-filing? Vu said his office doesn’t want to burden small campaign committees or make it harder for people to run for office. Even small campaigns use computers to track their donations and spending, said Ben Katz, a San Diegan who co-founded ISPolitical, a software company helping campaigns do exactly that. Katz said these financial reports are so complex that tracking everything electronically is necessary. Katz’s company has rates starting as low $50 a month for small campaigns. He also has competitors who offer similar e-filing services, including Aristotle and NGP VAN, which help campaigns track their finances digitally, even for candidates running for water district or school board positions. Some California counties have decided that even small campaigns should e-file. Contra Costa County requires all campaign committees to e-file. Sacramento, San Francisco and Santa Clara counties make all campaigns that raise or spend at least $1,000 in a calendar year file electronically. Still, other places haven’t required anyone to e-file yet, including Alameda and Imperial counties. Because every local government runs its own elections, each can choose how to collect records from candidates and make them available to the public. As a result, the effort to move toward digital record keeping has been slow across the state and the country, said Jessica Levinson, a campaign finance expert and professor at Loyola Law School. 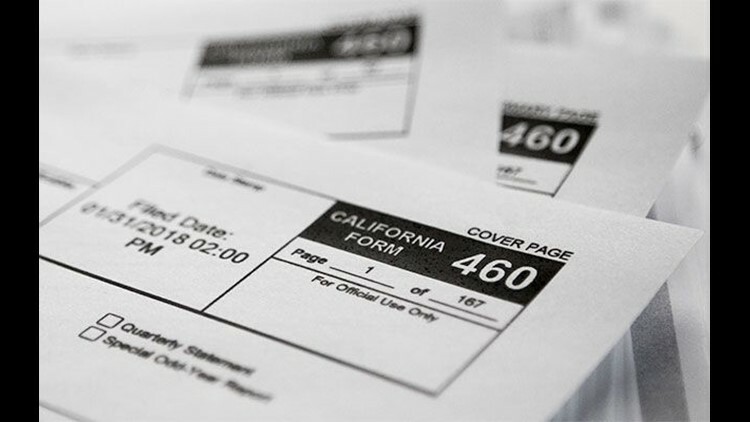 The city of San Diego has spent 12 years expanding its e-filing system. It now requires e-filing of lobbyist reports, as well as the reports politicians and government officials use to disclose possible conflicts of interest. The county doesn’t require any of those records to be filed electronically. Vu said he’s open to considering stricter e-filing rules for campaign finance reports. Maland said she has advocated for the city to increase transparency in the election process, and she credited the City Council for its support. “I couldn't do my job the way I feel like I need to do my job if I didn't have the support of the legislative body,” she said, explaining that it takes a lot of city offices and elected officials to keep improving the e-filing system. “It's so important that people have access to as much information as possible so that they actually can actively participate in democracy. That's, I mean, it's what we're all about,” Maland said.